My 4th grade year was made fabulous by Mrs. Hoke. Mrs. Hoke taught me that learning can be fun. She was hilarious and helped me improve on some of my work habits! When I was finishing 3rd grade, I went to meet a 4th grade teacher. Miss Snedeker was the teacher that I met. I knew that I wanted this teacher from the moment I saw her. She looked like a fairy! Her puffy golden hair spilled onto her shoulders. She looked down on me kindly. And she was funny! On the first day of 4th grade, I saw my name under Mrs. Hoke. I was so disappointed because I wanted Miss Snedeker. When I arrived at her classroom, I thought: “Isn’t this Miss Snedeker’s classroom?” It was then that I realized that Miss Snedeker had turned into Mrs. Hoke! I was so happy! When Mrs. Hoke was reading a book aloud to us and got to a part where someone was beheaded, I got a disturbing image in my mind that I could not get rid of. Mrs. Hoke told me to pretend that the heads were made out of paper. It worked! When we were doing math, Mrs. Hoke asked a student to explain how much of a fraction a shape was. The student said: “I think those little boxy things are 16ths.” Instead of saying “Please use the proper name of the shape”, Mrs. Hoke wrote on the board ”The little boxy things are 16ths.” It made the class burst into laughter! 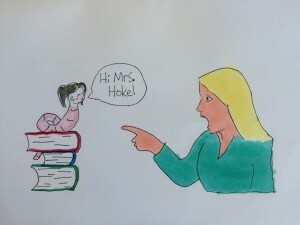 I can’t see how anyone would not like Mrs. Hoke. She was one of the best teachers I ever had and I will miss her dearly when she moves to Utah this summer.  I hope she has a lot of fun teaching at her new school! During winter break I might go skiing  in Utah and I will be sure to visit her!